Though this year, the monsoon was slow initially, later on it picked up and overall the rainfall in India has been good! Well, what with most of our towns and cities with inadequate drainage facilities and little planned facilities in villages, water is bound to stagnate at most places. And stagnant water being the ideal breeding ground for mosquitoes, there is a surge in mosquito borne diseases like malaria, dengue and chikungunya. With its tropical climate, high temperatures, high humidity, and stagnant waters, India provides the ideal environment for mosquito larvae to mature and breed. India is also a home to anopheles mosquito which transmits malaria. About 2 million confirmed malarial cases and 1000 deaths are reported annually. India contributes 77% of the total malaria in South East Asia, as per this source. Malaria is a grave disease that is transmitted to humans by the bite of an infected female Anopheles mosquito. An infected Anopheles mosquito bites a person and through its saliva injects the malaria parasites (Plasmodium) into the blood. These parasites then travel to the liver where they mature and reproduce. 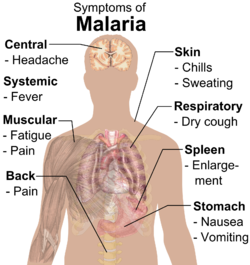 The signs and symptoms of malaria typically begin 8–25 days following infection. Symptoms may include fever and flu-like illness, including chills, headache, muscle aches, vomiting, coughing, diarrhea, abdominal pain, anemia and fatigue. Certain types of malarial fevers are more dangerous than others. If not treated properly, malaria may sometimes result in liver or kidney failure, coma, and death. Prevention is always better than cure, more so in the case of a near life-threatening disease like malaria. 1. Try every possible means to avoid mosquito bites. 2. Try to keep your surroundings clean and dry. 3. Stagnant water should not be allowed to accumulate in and around our homes. If it does, then adding kerosene, rock salt or bleaching powder to it prevents the mosquito from breeding there. 4. Sleep under mosquito nets. Use insect repellant creams. 5. Avoid the outdoors between dusk and dawn when mosquitoes are most active. 6. Consult a health care professional and take anti-malarial pills if you are visiting malarial prone areas. 7. Know the symptoms of malaria. As mentioned earlier, symptoms can occur within a week of exposure or even after several months. So be aware. 8. Seek medical attention if you experience symptoms. Malaria can be treated effectively if detected early. It's not mere speculation but a fact that some people are more attractive to mosquitoes and mosquitoes do have blood-sucking preferences. As per a WebMD article, certain elements of our body chemistry that, when found in excess on the skin's surface, make mosquitoes swarm closer. Also people with high concentrations of steroids or cholesterol on their skin surface, those who emit lots of carbon dioxide (especially this happens after a workout), those who sweat a lot attract mosquitoes. Pregnant women are also appealing to mosquitoes as they produce a greater-than-normal amount of exhaled carbon dioxide. Pregnant women are more vulnerable and are 3 times more likely to develop severe disease than non-pregnant women, as per this source. Malaria in pregnancy can lead to miscarriage, premature delivery, low birth weight, stillbirth, birth defects and/or death of the mother. Malaria kills up to 200,000 new-born babies each year. Hence pregnant women need to take every possible precaution to avoid malaria. * Drink lots of water, preferably RO purified water or boiled and cooled water. * To a glass of water add 3-4 Tulsi leaves and 2-3 cloves and boil it and have this mixture. Tulsi is very effective in all kinds of fevers. * Avoid non-veg foods and processed and canned foods. * Eat fresh foods and foods rich in iron, magnesium and calcium. * Eat easily digestible foods and have rice gruel (Kanji) and/or ragi (finger millet) porridge. Read the post Home Remedies for dengue for more tips. * Urinate when you feel the urge and do not hold it for a long time in your bladder. * Try not to get constipated. You may even take an enema twice a week to cleanse your bowels fully. * Grapefruit has been found to be one of the most effective home remedies for malaria. Grapefruit contains a natural quinine-like substance. It can be , which can be extracted by boiling a quarter of a grapefruit and then straining its pulp. Have it regularly when you are recuperating. * Cinnamon is also regarded as one valuable antidote when you are recovering from malaria. Listed below are two beverages that will provide relief from the symptoms of malaria. Pour a glass of water in a vessel.Add 3 cinnamon (Dalchini) sticks, ½ tsp Black Pepper (Kali Mirch) to it and heat it . Add ¼ to ½ tsp of dry ginger powder (optional). Let it come to a boil. Strain it in a glass and add ½ tsp of honey and squeeze the juice of ¼ th lemon into it. Have this beverage when it is sufficiently hot, twice a day, once after taking your food in the afternoon and once at night after dinner. Boil a glass of water in a vessel and add ¼ th tsp of fenugreek seeds, 3-4 cloves, 4 cinnamon sticks and 4-5 neem leaves. Let it come to a boil and then simmer for a while. Strain it into a glass; it will be bitter to taste but nevertheless it's a wonderful antidote and even suitable for those with diabetes and high blood pressure. Have it two times a day -- once before taking breakfast and 1 hour before going to bed at night. Can be taken along with allopathic medicines too. Never take any medication when the temperature is rising it can prove dangerous always take or give medication when either when the temperature has gone up and stabalized or when it is down, but never when the temperature is on the rise.